Throughout Muybridge in Kingston, the Stanley Picker Gallery collaborated with Kingston Museum to give local schools the exciting opportunity to interact, explore and create new artwork across Kingston upon Thames. Participants were introduced to the work of Eadweard Muybridge and on a visit to Muybridge Revolutions examined original examples of his photographs and inventions including the zoopraxiscope and accompanying discs, and learnt about how these have influenced modern photography, film and animation. Through drawing, discussion, photography and performance children considered Muybridge’s achievements and character, his fictionalisations and ambition and, in turn their own. Inspired by the blue plaque dedicated to Eadweard Muybridge in the town centre, children created their own versions and acted out the ambitions detailed on their plaques, professionally photographed in a series of successive images which were transferred onto teir own working zoetrope models. Pupils also explored Trevor Appleson’s film and sound installation Dance of Ordinariness. Thematic games were played in the space and we discussed the installation and its connection to Muybridge. 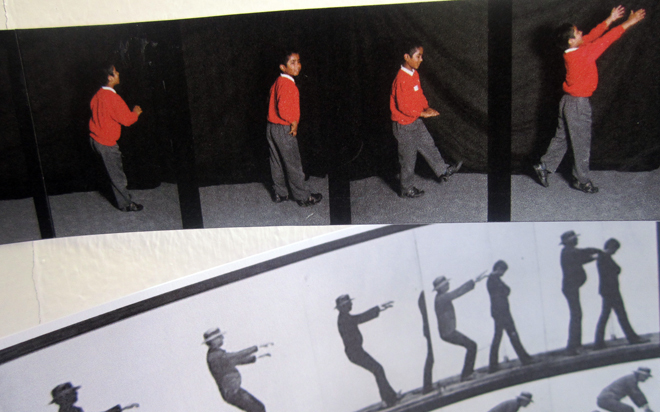 Children selected a Muybridge ‘film still’ and considered the person, animal or event behind the scene to inspire, compose and perform a contemporary dance piece, complete with title, sound effects and props. Chandlers Field School were lucky enough to have Trevor Appleson in their audience who also took part in a Q&A session. Much enjoyment was had by all, the pupils thrilled to meet a ‘real living artist’ and Appleson was pleased to share his experiences and autographs with the group. Participants: St John’s C of E Primary School (Year 5), Chandlers Field Primary School (Years 3 & 4) and the Stanley Picker Gallery Art Club.